2018 ROCK4CHOC Continues to Raise Support for Children's Hospital of Orange County Ahead of CHOC Walk in the Park! 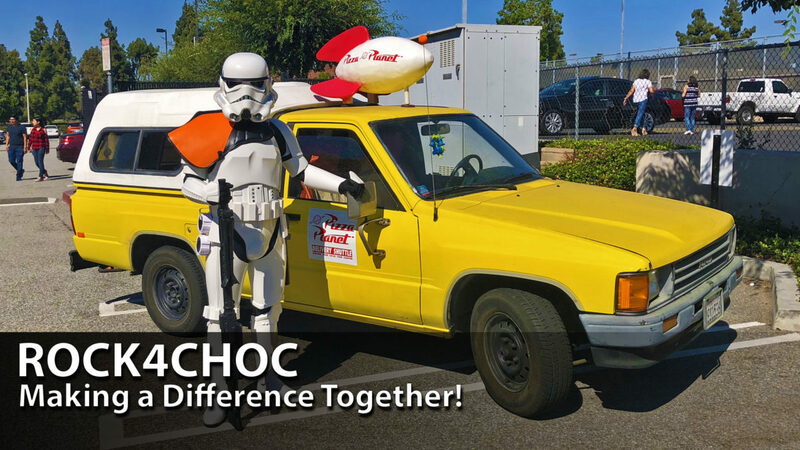 On Sunday, August 5th DAPS MAGIC partnered with the CHOC Walk in the Park and Hour of Power with Bobby Schuller to host the 2nd annual ROCK4CHOC. This event exists to raise money and awareness for the Children’s Hospital of Orange County as part of the CHOC Walk in the Park fundraising. This year, the event raised over $2,500 the night of. With two months left of fundraising, it is hoped that this number will at least double. If you would like to join the cause and support, go to chocwalk.org/dapsmagic. The event was even bigger than the first year. Dozens of Star Wars personalities, some music guests including Hooray for Our Side, the Pizza Planet Truck, the swat truck from Irvine Police Department, Beach Bus Bistro, Zach Abrams from CHOC, and the family of Carter Ankeny who shared their story of how CHOC has impacted their lives. A silent auction was also held to raise money for CHOC Walk in the Park. This is an event that DAPS MAGIC puts on to help raise both funds and awareness for what CHOC does. It is one of several events that are held by different CHOC Walk teams leading up to the event on August 26th at Disneyland. These events benefit the children and their families that are treated at CHOC. The second annual ROCK4CHOC was a fantastic way to spend a Sunday evening in August. It was a lot of fun to see a community of people come together from many different parts of Orange and Los Angeles counties to help a very good cause. The work isn’t done yet though. It continues. We invite you to join Team DAPS MAGIC on August 26th as we walk in the park for this year’s CHOC Walk in the Park. You can join the team by going to CHOCWALK.ORG/DAPSMAGIC and registering. The morning of the walk, the team all wears their best hats and has a blast walking to make a difference. We hope you’ll consider joining us! DAPS MAGIC would also like to thank all of those who helped make this year’s ROCK4CHOC so special! Listed below is a collection of those who participated. Beach Bus Bistro will have food and shave ice! Thank you to everyone who helped support ROCK4CHOC! We hope we’ll see you in the parks! What was your favorite part of ROCK4CHOC? Let us know in the comments below! Let’s go out and make a difference!